Earn 25% Commissions, Get Free Jewelry and No Cost To Start! Hi! My name is Nicole Bailey-Warren and I am a Rep for Designer Sara Blaine. I have a strong client business and a growing digital business on the web. I’m looking for people to help me expand my digital business and we are willing to pay them well. It doesn’t cost a penny to set up your very own Sara Blaine Boutique and the company will pay you 25% of every dollar of jewelry purchased by your friends and contacts on Facebook and Twitter. All you have to do is “click open” to set up your store and “click share” to post special offers from the company to Facebook! We realize that you’re helping us reach a person that we normally couldn’t reach through traditional advertising and that’s why we’re willing to pay you 25%. And if you’d like to help us even more by signing up your friends as Sara Blaine Associates, we’ll pay you 10% of what is sold through their e commerce stores when they “click open” for free and then “click share.”But the best part is our Grand Opening bonus! For your first 101 days the company with match your 25% cash commission with 25% of free product. They will even match the 10% bonus on Associates you sign up direct to you with 10% free product during their Grand Opening. 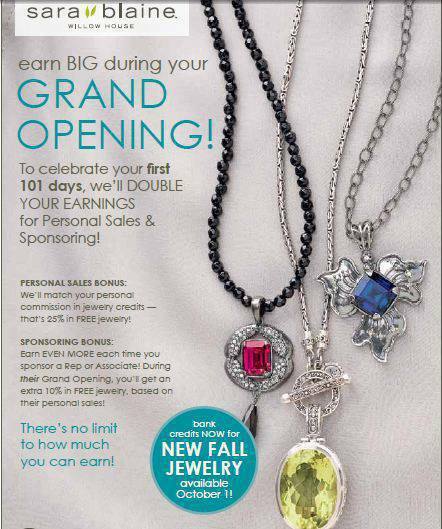 There’s no limit to the number of Associates you can enroll and no limit to the cash or jewelry you can earn. What a great way to earn extra money and gifts for Christmas! *If you’re not interested in becoming an Associate for free, maybe you know someone who is! Please share this with them. Also, our company recently started our Pay It Forward program, choosing a different charity and piece of jewelry each month to give back. I was so honored to have been given the opportunity to choose this month’s charity, HELP SAVE PETS! Please consider paying it forward in August. In honor of my 5 year Anniversary with Willow House this month, AND the adoption of our 2 rescue beagles, I will give back $2 personally on each piece sold that will go to help our local chapter! When you buy our Audrey Sunset bracelet this month, the company will donate $2 too! Sara Blaine jewelry is a designer line of jewelry using higher end materials – semi precious gemstones, sterling silver, and 18K gold as well as alternative metals while integrating the designs into today’s fashion world. Sara Blaine does not buy and resell other company’s products, which many of the other companies do. She designs each and every piece. She examines every gemstone that goes into her designs. She orders the stones to be cut to her own specifications and her own unique ideas. Sara Blaine IS A PERSON – not a corporation. d. Sara Blaine jewelry is a “collectible” that is not purchased as a “one of” item. 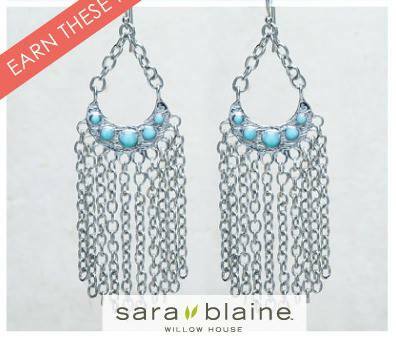 Women who purchase Sara’s jewelry, come back to look for more to add to their Sara Blaine collection. Sara Blaine designs “collections”. This means she designs pieces that usually layer in multiples – her necks can be worn separately as a single statement, or layered with 2 or 3 pieces completing a story and a look. Sara designs her earrings in different lengths, offering women a choice and creates a lot of her earrings to be flexible that can be worn interchangeably in multiple collections. She pays special attention to the weight and elegance in her design of earrings as she feels they need to say something without screaming or dragging on your earlobe! Sara then offers the accessories to the collection, completing the dress up with bracelets in multiple or single pieces and completes her look with elegant, yet bold and fun rings – always keeping comfort in mind. Something else that sets her apart from some of our competitors, is the fact that, rather than purchase finished made product from a factory’s assembly line, Sara produces her components individually from all over the world, including Italy and right here in the USA. Sara and her team inspect every component individually for its quality and integrity, before she sends them to her factory for use in her designs. When she orders her cuts of gemstones, which also come from all over the world, she first considers where they come from and where she will ask them to be cut. There are many things Sara takes into consideration as it relates to her designs, however, she also believes in the moral responsibility we have as an organization as to who we support.